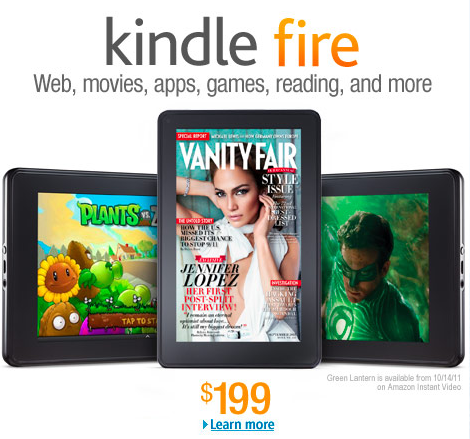 The mobile tablet technology movement is on “fire” and Amazon has just released the new Kindle Fire. The tablet appears as though it will provide the same valuable components and features as the iPad minus the built in camera and at less than half the price. Has the Apple iPad finally met its match? Comparing mobile devices especially tablets can be time consuming and complicated so here are two sites that take all the hassle and techno-babble out of the research for you. These are the reviews and comparisons as provided by CNET, TabletPCReview, and PCWorld. Looks like I may have found the perfect Holiday gift for my wife. The iPhone is too small to read her emails and browse websitesthat aren’t mobile ready. The laptop is too big and bulky and quite cumbersome and timely to launch in many inconvenient locations. The Kindle Fire is a bit smaller in size and in price making it the perfect mobile device for all her needs.